The first thing I went for after opening the box was, of course, the Hershey’s KISSES. It’s a good thing I was sent a family size bag because everyone in this household is a Hershey’s fan! Most of you already know how delicious these sweet little treats are, but do you know how versatile they can be? 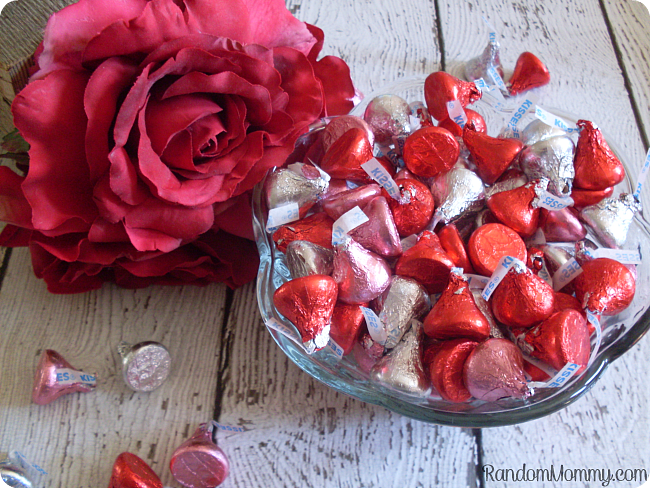 Turns out there are many recipes and crafts you can make using Hershey’s KISSES! This was my first time trying this brand of tea. I tried their Creme Caramel flavor, as well as the Lemon Chiffon. The Lemon Chiffon is decaffeinated. I often will drink a cup of tea before bed. It’s just very relaxing to me. This one is amazing! I think I may have found a new nighttime tea. The Creme Caramel flavor gave off such a pleasant aroma. I couldn’t wait to try it! It certainly didn’t disappoint. 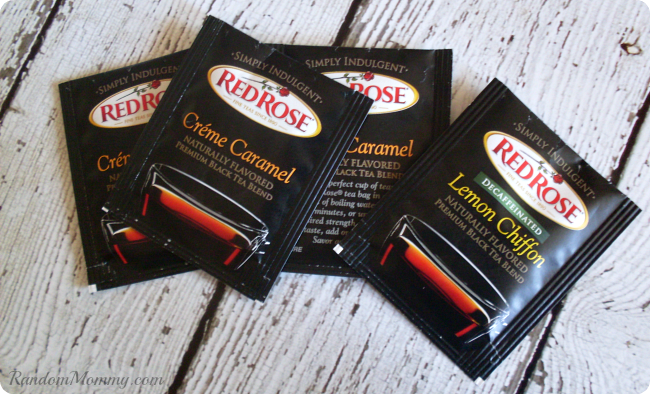 I love caramel, I love tea, and this is the perfect marriage of the two. I’ve already added it to my shopping list! I don’t have much experience with clay masks. the first time ever tried one was only a couple months ago. 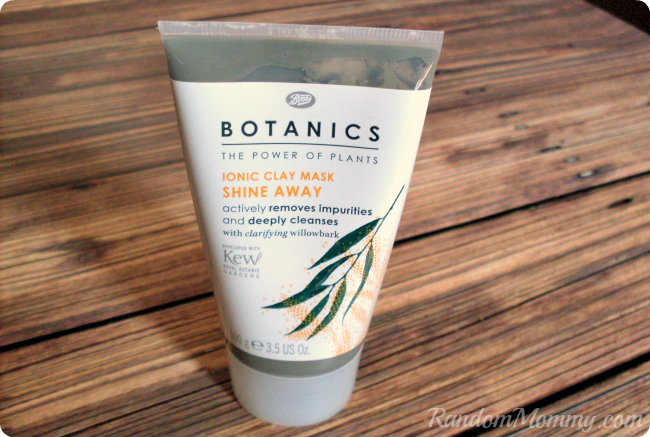 The Boots Botanics Shine Away mask was easy to apply. It dried pretty quickly after application. My 3yr. old really got a kick out of my green face. She had never seen me with a clay mask before. After the ten minutes, it rinsed off easily and my skin actually felt a little smoother. As I said before, I’ve never tried false eyelashes before, and probably never would have if it wasn’t for Influenster. At first, it took me a bit to figure out how to place them correctly without poking myself in the eye, lol. If you’ve never worn them before either, what you do is put a little adhesive on the lashes, wait for it to get tacky, then place them along your lash line. This is probably very easy for those that have done it before, but to be honest, it took me more than a few tries. That is to be expected with anything new, I suppose. Once I got that first one on, it was smooth sailing with the other. The 3-Day Straight spray from Frizz Ease is great for me. I use a flat iron on my hair a lot. If I don’t do that or blow dry, it just sticks out every which way. This spray is supposed to help keep hair nice and straight for up to three days or your next shampoo, whichever comes first. There are definitely times that I end up going almost three days between washes. I am a mom after all! 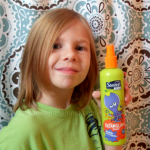 All I have to do is spray it on my hair when I get out of the shower and then style as usual. So easy! How did it measure up? Well, Hubby isn’t always the best at giving me a “review”. Either “It works like it should” or “It’s junk”, lol. So, the verdict is that is does what it says, which is great! I can add to that by saying that it sure does make him smell sooooooo good. I LOVE when he uses it! There you have it. 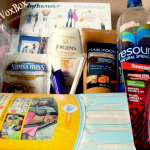 All of the J’Adore VoxBox goodies. Have you tried any of these products? If so, what did you think? Oh wow, there was so much good stuff in there, huh? Especially those Hershey Kisses…yum! I love my J’Adore VoxBox too! 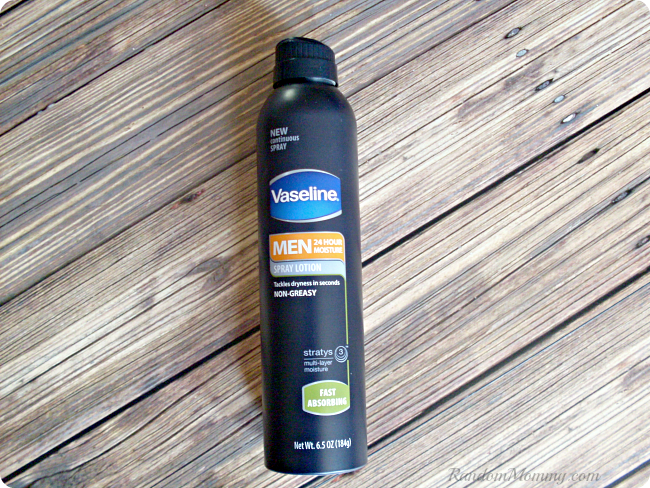 I think my favorite product was the Vaseline Men lotion spray…it really works great and I like the scent. Your photo of the KISS lashes really shows how amazing they are too! Jessica Beal Harlow recently posted..Loft Freshwater Blue Stretch Bracelet Bunch just $5.19! I love these boxes! So many goodies and really, who could pass up chocolate! Ooh yea this box would make for a nice surprise gift! Looks like a wonderful box of goodies! I would like to try this service! I’m really impressed with how much stuff came in the box! I could really use that 3-Day Straight spray from Frizz Ease! I wish that spray lotion was for women though. That looks like a fun box! I would like to try the lemon chiffon tea. 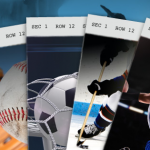 This looks like a really great collection of goodies! Those lashes look amazing! Love these boxes! What A Great Box Of Goodies I Love The Frizz Ease & Clay Mask I Could Really Use!! Wow, you really lucked out with that wonderful Vox Box! 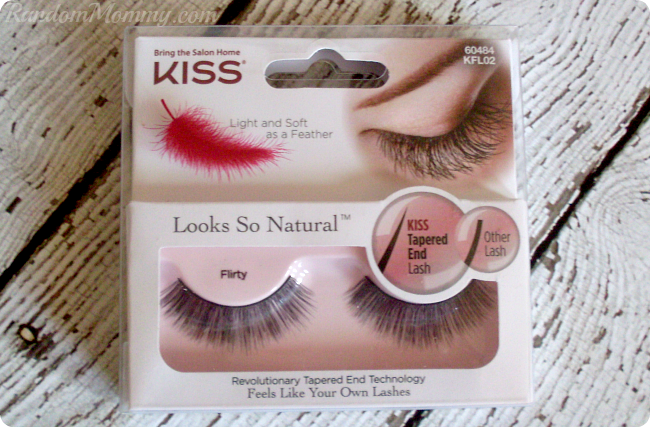 These are great products, I so have to try these eyelashes! I love boxes full of goodies! Especially when those boxes have chocolate! 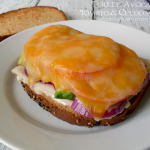 Debbie Denny recently posted..Take your Spring Break in Comfort and Style! Glen Eden Resort! I had some trouble putting the first one on since I’d never done it before. Once I figured it out though the second one was much easier. Tonya James recently posted..Coach Daisy Madras Packable Weekender Tote #Giveaway! 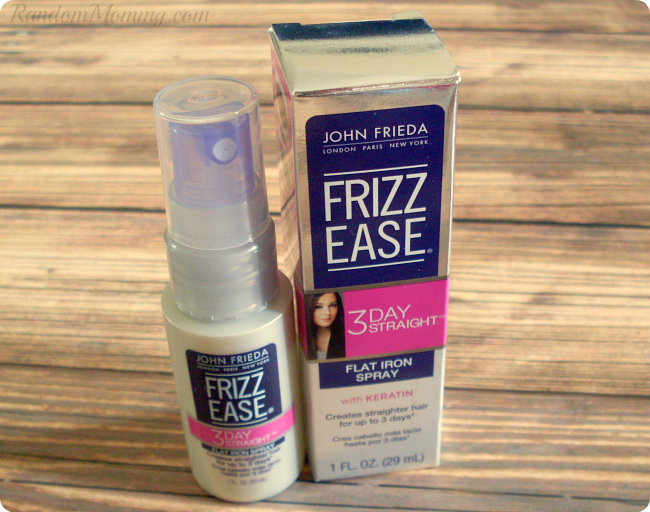 I also received this box of goodies and am loving the John Frieda Frizz ease!! Ok, I’m totally going to try those lashes out. They really DO look natural! I like boxes like these. It is nice to be able to try products out without spending a lot of money and then discover new favorites to buy. Wow! Those lashes look really beautiful on your eyes. I’ve seen some that look really fake but these make your eyes look naturally glamorous. Love it! What a great box. I love these because it is always a little surprise. love the fake eyelashes and frizz ease– definitely need the frizz ease today!